During finishing and polishing procedure, the filler particles of resin composite may be loosened or fractured, and the organic matrix may be removed, exposing the filler particles. Thus, roughness can establish a comparison of the performance of these materials. The aim of this study was to evaluate the effect of some finishing and polishing systems on the surface roughness of microhybrid, flowable, and packable resin composite materials. Three different resin composites were used in this study: A flowable resin composite (Heliomolar flow; Ivoclar Vivadent, Schaan, Liechtenstein), a hybrid resin composite (TPH spectrum; Dentsply, Latin America), and a packable resin composite (Tetric Ceram HB; Ivoclar Vivadent, Liechtenstein) [Table 1]. Stainless steel mold (6 mm in diameter and 3 mm in height) was used to prepare 40 specimens from each one of the restorative materials. To prepare each sample, the mold was placed on a glass slide covered by Mylar strip and the uncured resin composites were then placed in the mold. Another Mylar strip was then placed over the mold and the material was compressed with a glass slide, thus extruding the excess resin composite and forming a flat surface. The samples were polymerized from the top of the mold with a tungsten halogen light (Coltolux 3; Coltene/Whaledent Inc., Cuyahoga falls, OH, USA) for 20 s. Then, each sample received additional light curing for 20 s from the bottom surface to ensure complete polymerization. The intensity of the curing light was 550 mW/cm 2 , as verified with a hand-held radiometer (Curing Radiometer Model 100; Demetron/Kerr, Danbury, CT, USA). Group D: Polished with Soflex system (3M ESPE, St. Paul, USA). The tested polishing systems have been presented in [Table 2]. Before the polishing procedures, except for the control group, finishing was performed with 30 μm diamond finishing burs (Diatech; Diatech Dental AC, Heerbrugg, Switzerland) using a high-speed handpiece at 40,000 rpm under three-way water cooling for 10 s. The finishing bur was changed every five samples. Then, the polishing procedures were carried out with a slow-speed handpiece (NSK Ti-Max Electric Handpiece; NSK, Chiyoda, Tokyo, japan). Except for the control group, finishing and polishing procedures were carried out immediately after curing of the samples, resembling the clinical condition. For samples finished with Astropol system, the speed of the handpiece was set at 10,000 rpm with water coolant, as per the manufacturer's instructions. The polishing procedures were started with gray followed by green and finally the pink rubber cup, each for 15 s. For samples finished with Enhance system, the speed of the handpiece was set at 10,0 00rpm without water coolant, as per the manufacturer's instructions. The samples were polished for 15 s with the disks, followed by 10 s of polishing using fine polishing paste and additional 10 s using extra-fine polishing paste (Prima-Gloss; Dentsply, Latin America). The samples were rinsed with water for 10 s and air dried for 5 s between polishing paste application and after completion of the polishing procedure. The samples finished with Soflex system were polished with the medium disks at 1000 rpm for 10 s and then with the fine and extra-fine disks each for 15 s at 30,000 rpm in a dry field. Each sample was subjected to polishing procedure according to the manufacturer's instructions concerning the speed of the handpiece and the time of application, not the number of strokes. As all samples have a flat surface, the motion of the polishing system was a simple straight motion from left to right. All finishing and polishing procedures were done by a single author to eliminate inter-individual variation and to exert the same pressure as possible for all samples. Before any measurement of the mean surface roughness (Ra), all samples were rinsed with water for 10 s and air dried for 5 s. The Ra of each sample was measured with a profilometer (MarSurf PS1; Mahr GmbH, Gottingen, Germany). Each sample was measured three times to record the Ra. The sample was rotated 120° after each measurement. After recording the Ra value of each sample, the collected data were used to calculate the Ra value of each group. The observed data were subjected to statistical analysis. One-way analysis of variance (ANOVA) at a significance level of α = 0.05 was used. The mean surface roughness values and standard deviations of all groups are listed in [Table 3]. There was no significant difference (P > 0.05) between all groups. Of all tested resin composite materials, the control group (Mylar strip) exhibited the lowest Ra values. Soflex system recorded the lowest Ra values among the all tested polishing systems, while Astropol system recorded the highest Ra values. Comparing the resin composite materials, the lowest Ra value was recorded for the flowable composite, while the highest Ra value was recorded for the packable composite. Among all groups, the lowest Ra value was recorded for the control group of the flowable composite, while the highest Ra value was recorded for packable resin composite when finished with Astropol system. In this study, we investigated the effects of three different polishing systems (Astropol, Enhance, and Soflex) on the surface roughness of three resin composites (flowable, microhybrid, and packable). Under the conditions of this study, the control group of all resin composites which were cured against Mylar strip exhibited the lowest Ra value. This may be related to the absolute smooth surface of the Mylar strip. Also, resin composite surface untouched with any cutting instruments or any finishing and polishing systems had filler particles that were not abraded away from the resin matrix, which finally led to the creation of the smoothest surface of the tested resin composites. ,, However, the smoothest surface of resin composite is achieved under Mylar strip, but this surface cannot be maintained clinically because no flat tooth surface exists; otherwise, the complex tooth morphology will necessitate the clinician to make finishing and polishing for the restoration to reassemble the tooth complex morphology. In our study, among the tested finishing and polishing systems, groups finished with Soflex system recorded the lowest Ra value. This is in agreement with other studies. ,,, Many factors were responsible for this result. Ozgünaltay et al. suggested the ability of Soflex system to remove the surface scratches created by the burs, while Jung et al. attributed this result to the ability of Soflex system to abrade the filler particles and the resin matrix at equal rates. Neme et al. attributed this result to the two bodies wear process associated with Soflex systems; there is no free abrasive that could erode away the relatively soft resin matrix between the harder filler particles. Another explanation for this observation is the composition and way in which the aluminum disks were used. As they were used in decreasing the abrasiveness level, they promoted uniform wear and whatever polishing of the surface, regardless to the type of composite resin. On the other hand, the results of Marigo et al. are in disagreement with our study result. They mentioned that Soflex system gave rougher surfaces of resin composite than Enhance system. This disagreement may be due to the use of different types of resin composite than those used in our study. Another recent study is also in disagreement with our result. The authors found that the smoothest surfaces were obtained with Enhance polishing system. They reported that the reasons for this could be attributed to the following factors. This polishing system comprises the following: Aluminum oxide impregnated polishing disks and points, prisma gloss, and prisma gloss extra-fine aluminum oxide pastes. The aluminum oxide paste causes finer abrasion in comparison to impregnated disks or points used alone. In our study, the highest Ra value was recorded for groups finished with Astropol system. This result is in line with another study. This result may be due to the coarser abrasive particles in the Astropol system than in Soflex system. On the other hand, Sapra et al. found that the smoothest surface was recorded with Astropol system for some tested groups. This disagreement may be attributed to either the difference in the tested materials or the sample preparation techniques. Unfortunately, there are some limitations in this study such as the flat surface of the sample (a condition that does not exist clinically) and also, the study was performed in vitro, so the effect of oral environment was neglected. These limitations can be improved by preparing the sample in the tooth itself to follow the tooth morphology. Also, in vivo studies are required to investigate the possible effect of oral environment on the surface roughness of such restorations. Considering the limitations of this study, we can conclude that the smoothest surface of resin composite was achieved under Mylar strip. The difference in mean surface roughness among the tested polishing systems was insignificant; so selection among them will depend on individual preference and anatomy of the tooth. Estévez M, Vargas S, Castaño VM, Rodríguez JR, Hagg Lobland HE, Brostow W. Novel wear resistant and low toxicity dental obturation materials. Mater Letters 2007;61:3025-9. Oliveira GU, Mondelli RF, Charantola Rodrigues M, Franco EB, Ishikiriama SK, Wang L. Impact of filler size and distribution on roughness and wear of composite resin after simulated tooth brushing. J Appl Oral Sci 2012;20:510-6. Yap AU, Yap SH, Teo CK, Ng JJ. Finishing/polishing of composite and compomer restoratives: Effectiveness of one-step systems. Oper Dent 2004;29:275-9. Hafez R, Ahmed D, Yousry M, El-Badrawy W, El-Mowafy O. Effect of in-office bleaching on color and surface roughness of composite restoratives. Eur J Dent 2010;4:118-27. Yazici AR, Ozgünaltay G, Dayangaç B. The effect of different types of flowable restorative resins on microleakage of Class V cavities. Oper Dent 2003;28:773-8. Ghinea R, Ugarte-Alvan L, Yebra A, Pecho OE, Paravina RD, Perez Mdel M. Influence of surface roughness on the color of dental-resin composites. J Zhejiang Univ Sci B 2011;12:552-62. Tuncer D, Karaman E, Firat E. Does the temperature of beverages affect the surface roughness, hardness, and color stability of a composite resin? Eur J Dent 2013;7:165-71. Bagheri R, Burrow MF, Tyas MJ. Surface characteristics of aesthetic restorative materials - an SEM study. J Oral Rehabil 2007;34:68-76. Rios D, Honôrio HM, de Araújo PA, Machado MA. Wear and superficial roughness of glass ionomer cements used as sealants, after simulated tooth brushing. Pesqui Odontol Bras 2002; 16:343-8. Yurdaguven H, Aykor A, Ozel E, Sabuncu H, Soyman M. Influence of a prophylaxis paste on surface roughness of different composites, porcelain, enamel and dentin surfaces. Eur J Dent 2012;6:1-8. Lai YL, Lin YC, Chang CS, Lee SY. Effects of sonic and ultrasonic scaling on the surface roughness of tooth-colored restorative materials for cervical lesions. Oper Dent 2007;32:273-8. Pacifici E, Bossù M, Giovannetti A, La Torre G, Polimeni A. Surface roughness of glass ionomer cements indicated for uncooperative patients according to surface protection treatment. Ann Stomatol (Roma) 2014;4:250-8. Kawai K, Urano M. Adherence of plaque components to different restorative materials. Oper Dent 2001;26:396-400. Opdam NJ, Loomans BA, Roeters FJ, Bronkhorst EM. Five-year clinical performance of posterior resin composite restorations placed by dental students. J Dent 2004;32:379-83. Clelland NL, Pagnotto MP, Kerby RE, Seghi RR. Relative wear of flowable and highly filled composite. J Prosthet Dent 2005;93:153-7. Jung M, Voit S, Klimek J. Surface geometry of three packable and one hybrid composite after finishing. Oper Dent 2003;28:53-9. 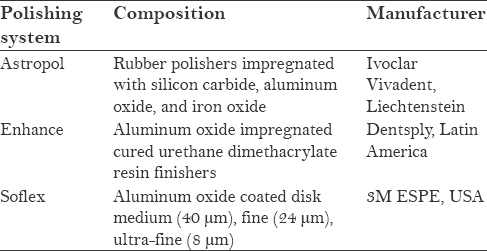 Uppal M, Ganesh A, Balagopal S, Kaur G. Profilometric analysis of two composite resins' surface repolished after tooth brush abrasion with three polishing systems. J Conserv Dent 2013;16:309-13. Yazici AR, Tuncer D, Antonson S, Onen A, Kilinc E. Effects of delayed finishing/polishing on surface roughness, hardness and gloss of tooth-colored restorative materials. Eur J Dent 2010;4:50-6. Neme AM, Wagner WC, Pink FE, Frazier KB. The effect of prophylactic polishing pastes and tooth brushing on the surface roughness of resin composite materials in vitro. Oper Dent 2003;28:808-15. Barbosa SH, Zanata RL, Navaro MF, Nunes OB. Effect of different finishing and polishing techniques on the surface roughness of microfilled, hybrid and packable composite resins. Braz Dent J 2005;16:39-44. Marigo L, Rizzi M, La Torre G, Rumi G. 3-D surface analysis: Different finishing methods for resin composites. Oper Dent 2001;26:562-8. Uppal M, Ganish A, Balgopal S, Kaur G. Profilometric analysis of two composite resins surface repolished after tooth brush abrasion with three polishing systems. J Conserv Dent 2013;16:309-13. Paravina RD, Roeder L, Lu H, Vogel K, Powers JM. Effect of finishing and polishing procedures on surface roughness, gloss and color of resin-based composites. Am J Dent 2004;17:262-6. Sapra V, Taneja S, Kumar M. Surface geometry of various nanofiller composites using different polishing systems: A comparative study. J Conserv Dent 2013;16:559-63. Gonçalves L, Filho JD, Guimarães JG, Poskus LT, Silva EM. Solubility, salivary sorption and degree of conversion of dimethacrylate-based polymeric matrixes. J Biomed Mater Res B Appl Biomater 2008;85:320-5.